When team transition from an iteration-based (i.e. Scrum) to a more flow-based (i.e. 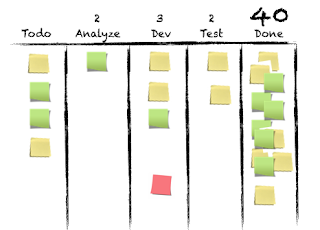 Kanban) approach to software development they often stand 3 big risks; no planning, no retrospectives and no celebrations. Which, when you look at it, just leaves work work work.Exactly - I wouldn't want that either.In this post I'll show you a little trick I picked up to handle the last one; no celebrations. I know I've stolen it from somewhere, but for the life of me I cannot remember where. Please enlighten me and I'll attribute you accordingly. [UPDATE]I picked this thing up from Joakim Sundén (see comments). Yet another thing he has thought me. Thanks dude! When team transition from an iteration-based (i.e. Scrum) to a more flow-based (i.e. 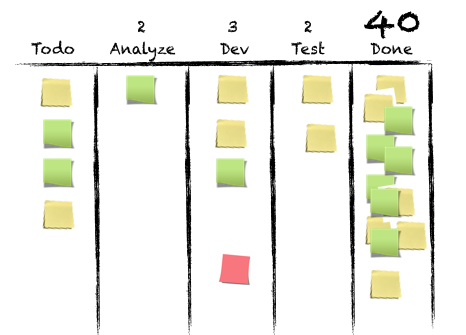 Kanban) approach to software development they often stand 3 big risks; no planning, no retrospectives and no celebrations. Which, when you look at it, just leaves work work work. Exactly - I wouldn't want that either. In this post I'll show you a little trick I picked up to handle the last one; no celebrations. I know I've stolen it from somewhere, but for the life of me I cannot remember where. Please enlighten me and I'll attribute you accordingly. I picked this thing up from Joakim Sundén (see comments). Yet another thing he has thought me. Thanks dude! In iteration based approaches to software development there's a natural end point, goal for the current work; the end of the sprint or iteration. That's one of the really great things about Scrum I think. The little helpful pressure that tells us that we need to get these items done. But using a more flow based approach such as Kanban there's nothing to hinder you from accomplishing that. You can have deadlines or Service Level agreements for when the items should be completed to get that on the individual work item level. When I first saw this I thought it was a prank of some sort so I asked the team. But "No", the explained, "when we've reached 40 items in the Done column work start to back up. And the only way to resolve that bottleneck is that the PO buys us a cake and congratulate us on a work well done." Simple and quite brilliant. You also re-introduce the all-too-easy missing celebrations, but based on the number of Done-items. "But, why 40, you ask." Well, pick a number that will give you cake at a reasonable interval. Maybe every 3 weeks or something. "But, will that not result in smaller tasks and trying to make them going faster over the board", you continue asking. Yes, I respond, and we want that. Right? "But, that is not a really important metric now is it? ", there's now dispair in your voice. No, not really. It's just for the team celebration, mind you. Just to get, what's called a nice cadence in our work. To avoid the monotonicity of just working of the backlog. For metrics I always start out with some really simple ones. It's easier to introduce metrics than it is to remove them so be careful. A small takes between 3-4 days. A medium have during the last 3 months taken around 5.7 days, with 2 ones off by mostly 10 days. Things like that. Pretty cool, huh? Stakeholders often values predictability over speed in my experience. Number of items done / week - with this simple metric we see our throughput. Are stuff coming out in the other end? Do we get anything done? Here too the actual number is not that important but the trends are. Start tracking in a nice diagram and post on the team wall to get good attention. Remember - the metrics are there for you to learn from. It's not an evaluation of you and your qualities, but rather the qualities of the current process. But without metrics you have no easy way of telling if you're improving or not.